This post was authored by Arun Sharma, Staff Engineer for Network Insight. This is a showcase from a real-life environment on which he worked on. Try Network Insight free for 30 days. 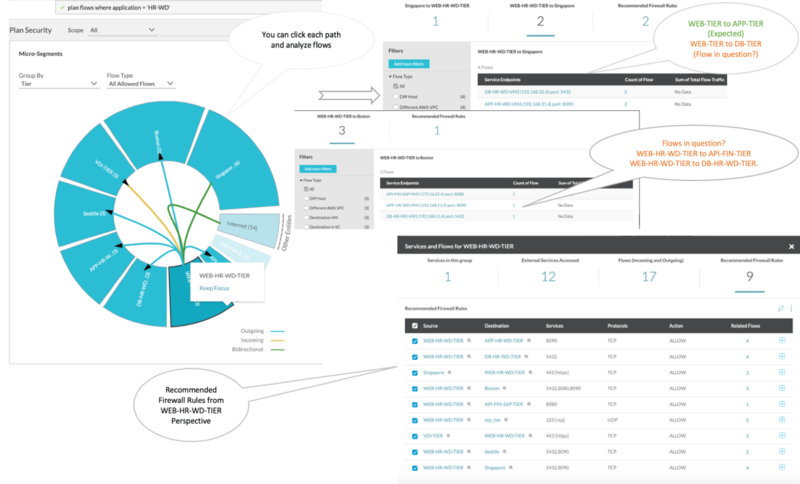 VMware Network Insight can be a great visualization tool to simplify network & security operations for virtual, physical and cloud environments. Because Network Insight correlates all aspects of your environment together, it can be used as an application mapping tool. It accelerates micro-segmentation deployment, minimizes business risk during application migration and enables your business to confidently manage and scale NSX deployments. This technical blog outlines how you can use VMware Network Insight to visualize and operate your geographically distributed applications. You could have distributed your application to ensure high availability and disaster recovery. As your applications spread out, it becomes significantly harder to ensure security, monitor and troubleshoot them. Using VMware Network Insight makes it easy for you to comprehend what’s going on and take full control over the visibility of your applications. VMware Network Insight helps to visualize all communication within and between applications, application tiers and geographical sites. Assume that you have 3 applications (HR, Finance, and VDI) and 3 sites (Boston, Seattle, and Singapore). The plan is to use VMware NSX Data Center to micro-segment the applications and ensure that these are adequately protected. 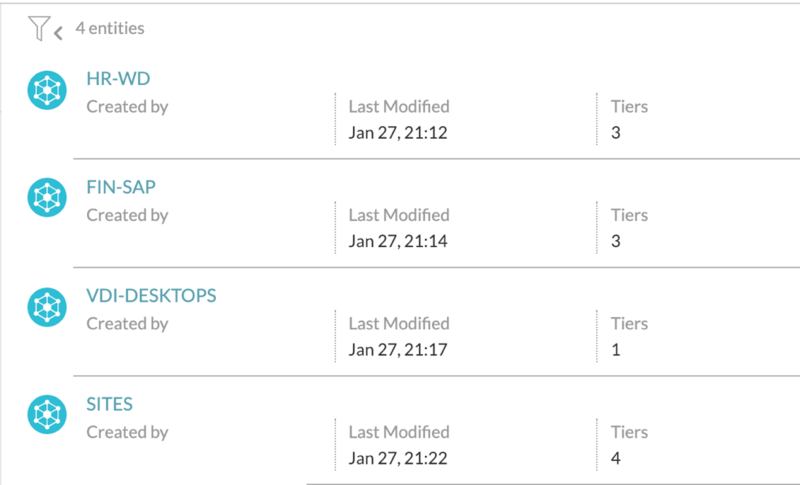 The following table details the application names, their respective application tiers, the VMware NSX security tags applied to the tier workloads and the IP subnet to determine in the intended location. Note: The application named SITES is important as it helps to correlate the location of the applications. In this case, subnets are used to identify each site. This can also be a logical construct like a cluster name or the vCenter that manages that site. Outgoing traffic to app tier of Finance application. Figure 3: HR Application with a focus on the web tier. Now, let’s look at the Finance application it the same way and visualize its flows, geographical sites and generate the recommended firewall rules. Incoming traffic from VDI-TIER residing in Singapore site. 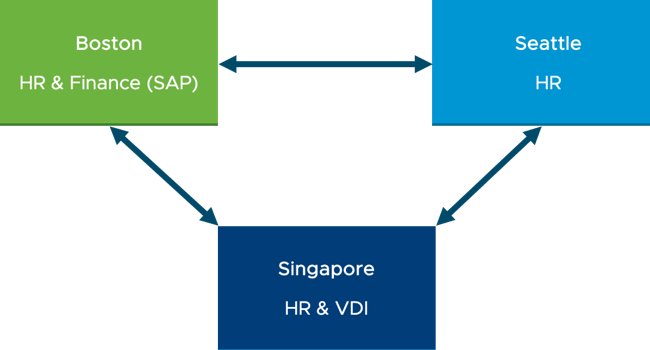 This was expected because from Singapore, VDI can access Finance application. Outbound traffic from GW-FIN-SAP-TIER to APP-HR-WD-TIER. This flow is in question, it was not expected. See more info in the diagram below. Incoming traffic from Internet. This flow is in question, it was not expected. Figure 4: Finance Application with focus on gateway tier. Figure 5: Finance Application with focus on gateway tier showing internet incoming traffic. Now, let’s see communication between Finance application API-FIN-SAP-TIER and HR application APP-HR-WD-TIER. As it was expected, there were supposed to be a communication between these two applications at APP-HR-WD-TIER and API-FIN-SAP-TIER level. We can check the communication between these two tiers as below. Figure 6: Two application tier communication. By referring to the recommended firewall rule above, we want to explicitly place this rule in firewall to allow this communication. In exactly the same way we visualized the network flows between applications, we can have a look at how much traffic is being sent between the multiple sites where the HR application is hosted. Specifically, we’ll have a look at the App tier of the HR application. Figure 7: HR Application App Tier geographical sites communication and bandwidth size. Above are only a few ways how you can visualize application connectivity. This provides some context and correlation which helps during troubleshooting, monitoring, and micro-segmentation security planning. VMware Network Insight solves the age-old question; what’s happening on my network? 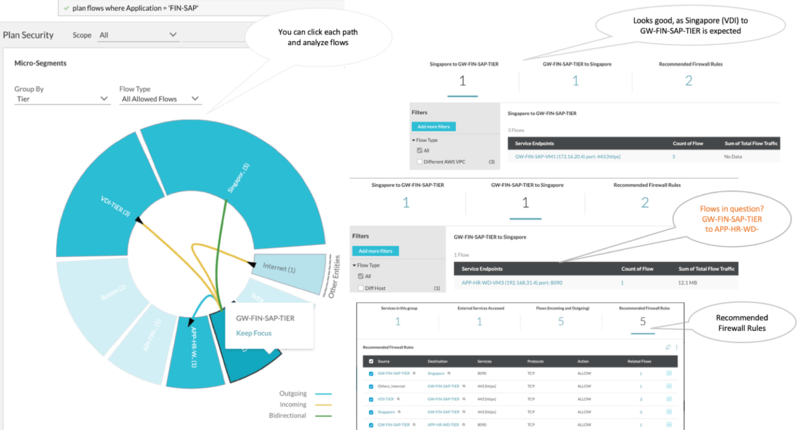 Only with the application context that VMware Network Insight brings, can you visualize your applications across multiple regions and answer that question. From the simple visualization to see what intra-application network flows there are, to drilling deep and seeing the exact network flows that are happening. Try VMware Network Insight free for 30 days or learn more. 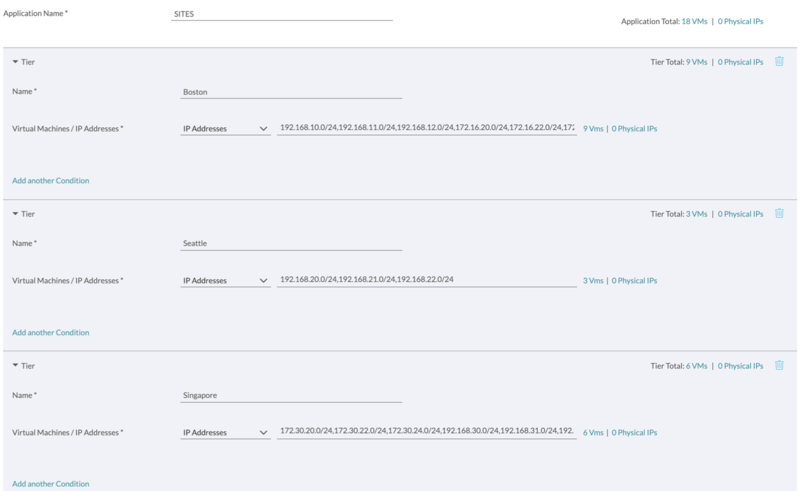 The post Using VMware Network Insight to Visualize and Secure Geographically Distributed Applications appeared first on VMware Cloud Management.